Little River is a rural township 44 km south-west of central Melbourne, on the train route to Geelong. The road from Melbourne to Geelong crossed the Little River and the Travellers Rest Inn was opened there in about 1840. In 1852 a township named Rothwell was surveyed in the vicinity of the inn, on the west side of the Little River. 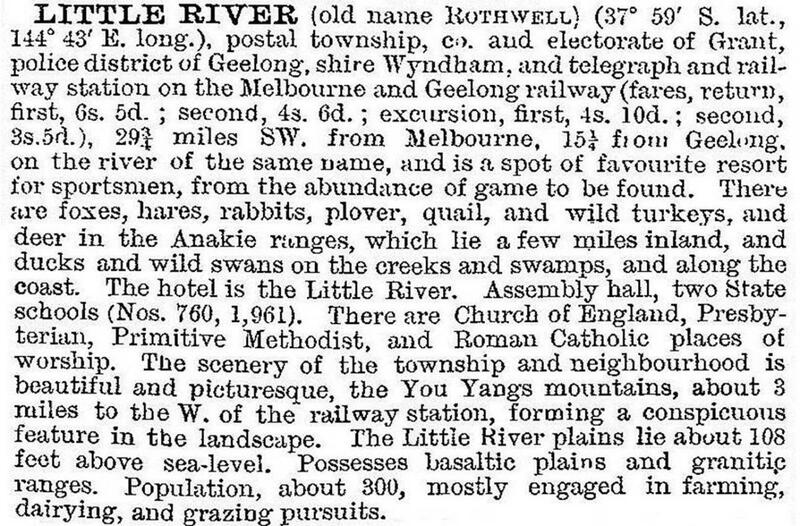 However, when the railway to Geelong was built the line crossed Little River about 1 km north of Rothwell, and the railway station and goods shed (1857) were built on the other side of the river. A township developed near the station and the Rothwell survey fell by the wayside. (The railway station and goods shed, and the Rothwell Bridge built for the old Princes Highway in 1866, are on the Register of the National Estate). An independent denominational school and St Michael’s Catholic school was opened in 1856 and 1858 respectively. By 1865 the township had three hotels and a mechanics’ institute. The surrounding land was good for grazing, with some dairying carried out. It had been one of the Port Phillip Association’s pastoral runs (the occupier being James Simpson), and later a large part of the district was included in the Chirnside estate centred on Werribee. Small farmers had the benefit of an 8000 hectare common for grazing, and there were sufficient settlers for solid bluestone Anglican, Presbyterian and independent churches to be built. The bluestone Catholic church (1858) was rebuilt in brick in 1922. Little River remained virtually unchanged for several decades, known principally as an agricultural district on the way between Melbourne and Geelong, and as a resort for sporting pursuits. The substitution of the Princes Freeway for the Geelong Road took passing traffic further south of the village.